Where and when you can see the plans? 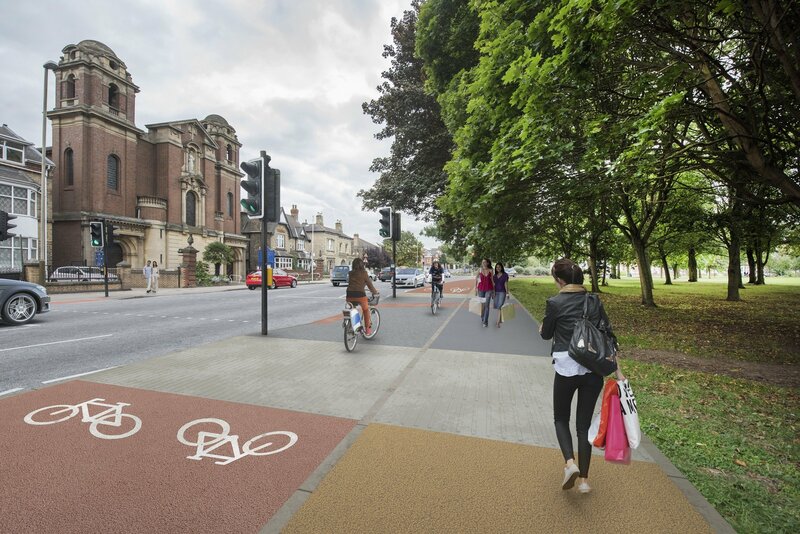 There is a consultation about the proposals to create a new cycleway from the Mayfield Road roundabout on London Road to the railway station area. The detailed plans and artists impressions will be on display in the Bowls Room at the Victoria Park pavilion on Wednesday October 25th from 2pm to 4pm and 6pm. Council officers will be present to explain and answer questions. The consultation closes on November 10th. Full detail of the proposals and the consultation can be found on the Leicester City Council website here. It’s an important consultation as the proposals will have an impact on the park, as well as on London Road itself. The more people who take part, the better the final design is likely to be so please make sure you have your say before 10th November. The cycleway will run alongside Victoria Park from Evington Road to the Mayfield Road roundabout. To create the space for the cycleway a strip of the park will be taken which will involve the loss of about 18 trees alongside London Road. Replacement tress have been promised for the park. In addition, the high hedge around the bowling green which forms the boundary with London Road will be lost, and there may be some changes in front of the lodges too. The plans and pictures at the consultation event will show these in more detail so please make the time to go and look and make your view known. What are the issues and dilemmas? For Victoria Park the issues are the loss of more trees, the loss of park land itself, the loss of the boundary hedge to the bowls green, and any changes in front of the lodges. It’s probably fair to say that nobody actively wants to see more trees removed from the park or park land lost. Similarly, the impact on the bowling green and around the lodges will be a concern for many. Alongside this, though, many people will wish to support the principle of a safe cycle route into the city and will not wish to see this scheme delayed or abandoned. This creates the dilemma. Can these two different sets of concerns be reconciled? The available space along this stretch of London Road is not sufficient to install a cycleway without taking some other space. There are only two options here. One is to take some of the park, which is what is proposed. The other would be to take some of the available road space, meaning reduce London Road at this point to three lanes. The problem then is that traffic congestion here is already severe and taking out a lane would make it much worse. A reversible middle lane for peak flows might be a solution, but this would have safety concerns, and the associated infrastructure would create something which looked like an urban motorway. The only other approach would be to say the cycleway should not come along this part of London Road but should divert elsewhere. However, this almost certainly means it would need to go across the park at some other point. There might be an argument for using coach drive to link the new cycleway to the national cycle route which goes across the park to the university and then along Peace Walk. However, this then loses the directness of the route from the South side of the city to the city centre. Essentially it leaves us facing some difficult choices over what we want to see happen, and what we think is best. If the priority is to protect the park from any changes and losses then the argument is either to take some road space, or route the cycleway elsewhere. If the priority is to have the cycleway route as proposed, then either trees and park land must be lost, or road space reduced. If the priority is avoiding increased traffic congestion through the loss of road space, which affects both private and public transport, then either the trees and park land must go, or the cycleway be rerouted. Essentially, there are no easy answers and there is no solution which will satisfy all concerns. The best way forward is to start a debate, exchange ideas, talk to your local Councillors, and make your views known by getting involved in the consultation before November 10th. You can also contribute to the debate by posting comments on the Friends of Victoria Park Facebook page, or on the Clarendon Park on-line community Facebook page. All or any of these are better than doing nothing. These are important proposals and we should engage with them and make our views known.